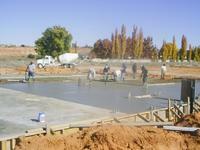 Here we see our foundation being poured! It is on a 4" base of ABS. It will take about 2 weeks for the concrete to be fully cured, but work on the structure can start a few days before that.